Be sure to check out tonight the close conjunction of Venus and Mars in the early evening in the southwest. 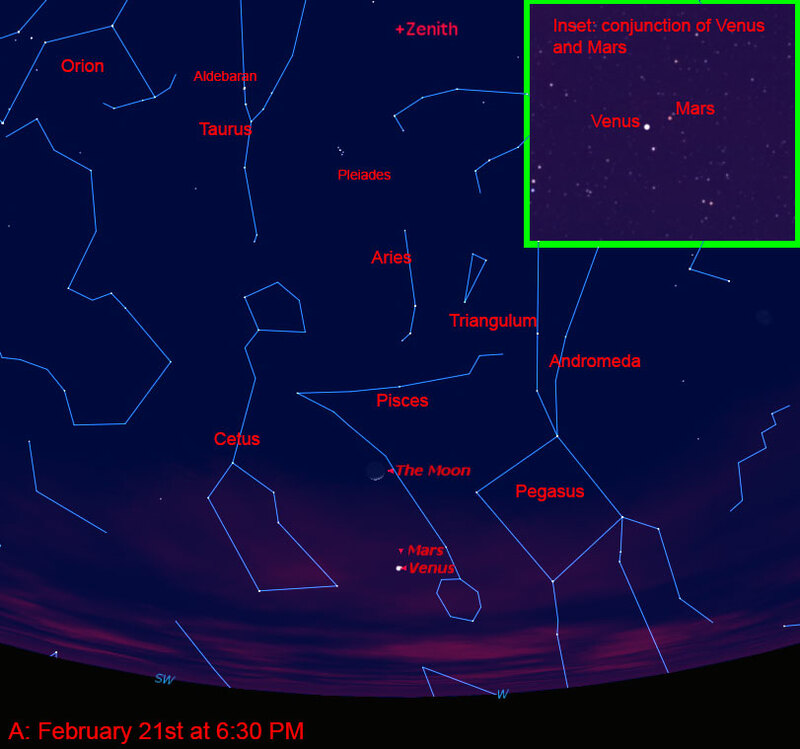 Mars will be slightly to the right of Venus about a pinky width at arm's length. Depending on how good your eyes are, you might need to use binoculars to pick out the much dimmer orange-red Mars against the brilliant-white Venus. A nice thin Waxing Crescent Moon is just above the pair. That should make for some beautiful sky photos! The first star chart below shows the view at 6:30 PM. Continuing upward very high in the southwestern sky at that time will be the beautiful star cluster The Pleiades, named after the seven Pleaides sisters of Greek mythology. Most people are able to spot six stars in the cluster under dark skies but sharp-eyed individuals can count up to nine and I've read reports of people counting up to 14 stars in the clusters without optical aid. With a camera attached to a decent size telescope, it is possible to see about a thousand stars in the cluster, but the cluster looks best in a pair of binoculars since a high-power telescope would be able to view just a small section of the cluster at one time (higher magnification is not always a good thing). The second brightest planet, Jupiter is already up in the eastern sky before the Sun sets, so now we're able to see the two brightest planets up at one time, though they are at opposite ends of the sky. Jupiter is continuing to move retrograde, backward to the west toward the dim constellation Cancer with the Beehive Cluster at its center. The now Waxing Crescent Moon will be at First Quarter phase next to the orange-red eye of Taurus, the giant star Aldebaran, on the 25th. A bright Waxing Gibbous Moon will be below Jupiter on March 2nd, washing out the rest of the stars near it. 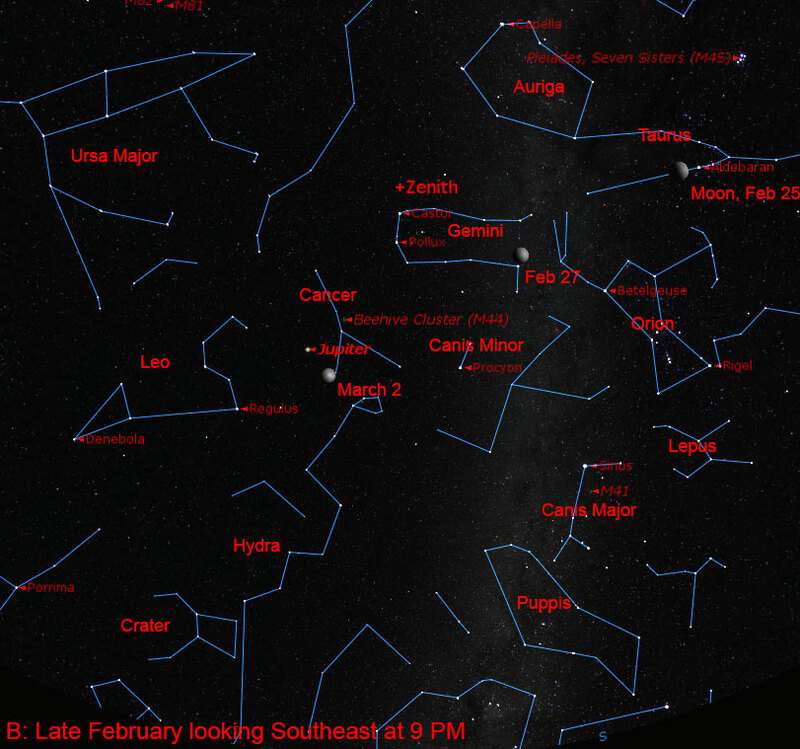 The second chart below shows the late February sky at 9 PM. In other local news, see the William M Thomas Planetarium's website for information about the two new geology-theme shows added to the spring line-up through a grant from Chevron. Last weekend an article about dark matter appeared in the Sunday paper. It was based on a recent result about dark matter in the inner part of the Milky Way, closer to the core than is our solar system. Our solar system is about 27,000 light years from the galaxy center. The Milky Way is about 100,000 light years across. If Pluto's orbit was shrunk down to the size of a quarter, the Milky Way would be the size of the western United States, stretching from Los Angeles to Pierre, South Dakota. The dark matter research paper strengthened the case for the existence of dark matter in our own galaxy without assuming a particular form for the dark matter (we still are not sure what the dark matter is made of but it's very likely made of a type of matter different than ordinary matter made of atoms). The dark matter research paper is essentially an extension or refinement of the technique used to detect dark matter for the past several decades. We measure the gravity effect of all of the visible, ordinary matter and the total gravity force at various distances from the galaxy's center. Comparing the visible matter gravity to the total gravity shows that there is a huge discrepancy between the two which must be filled in with the gravity of the dark matter. Past studies of the Milky Way show that dark matter is clearly present out beyond the Sun's orbit. The research paper was able to show that the dark matter has to extend inward to at least 9000 light years from the Sun's orbit (or 16,000 light years from the center) with a very high degree of statistical significance using all available observations of the distribution and motions of the visible matter in the galaxy. The dark matter undoubtedly extends even further inward closer to the galaxy center but the researchers had to restrict the usable data to outside of 8200 light years from the galaxy center because the motions of the stars and gas gets too confusing to deal with. Note that the supermassive black hole at the Milky Way's center is much too small to account for the dark matter and black holes are usually lumped with ordinary baryonic matter because they form from the collapse of ordinary matter. If the supermassive black hole at the Milky Way's center were to disappear, the Sun and other stars and gas in most of the galaxy wouldn't even notice because the supermassive black hole's gravity is tiny in comparison to mutual gravity of the stars, gas, and dark matter for each other. Having said that, you should still come to the Black Holes show on March 19th because things DO get very interesting very close to the center! A bit closer to home, the Dawn spacecraft is now getting the sharpest pictures yet of the closest dwarf planet to Earth, the asteroid Ceres. Dawn will begin orbiting Ceres at the end of this month and spiral inward to a much closer orbit over the next several months taking thousands of pictures and spectrometer measurements while doing so. Ceres is a water-rich asteroid with more fresh water than exists on Earth, though Ceres's water is frozen. Even closer to home was a recent NASA study that the drought conditions we're living with is the "new normal". The latest result is from an huge analysis of a drought severity index and two soil moisture data sets from 17 climate models using two different supercomputer projections of how much more carbon dioxide we'll put into the atmosphere over the next several decades. Previous studies had focused on just one drought indicator and used fewer climate models. The current study is also the first one to compare future drought projections with drought records from the past 1000 years. The drought records from further back than 150 years ago are written in tree rings. In wet years, trees such as oak and bristle cone pines and others grow more leaving wider rings. In drought years the rings are much narrower as the trees tough it out by cutting back on their growth. Some droughts that took place in between 1100 and 1300 in North America lasted for 30 to 50 years. These "megadroughts" are becoming increasingly more likely as the planet temperature increases. That bit of news seems a bit out of place with all of the short-term weather news of huge snowfalls in the eastern part of the country. What we need is a national system of canals/pipelines and reservoirs to connect the places getting too much water with those places getting too little. 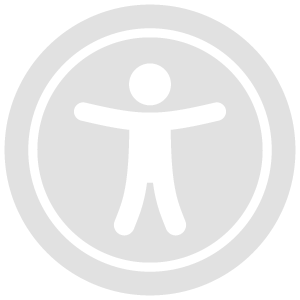 Something on the scale of the interstate highway system constructed by the previous generation. That would require the unity and political will of the previous generation.